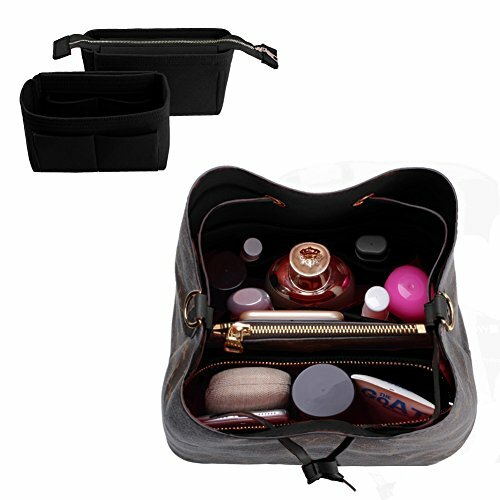 To save you all the trouble, time and moments of embarrassment, here is what we provide---a purse organizer, made of high quality felt fabric, elegant design, meticulous stitches, light weight (0.4lb), multi-pockets, various functions. Your Bag, Your Way! For home, travel, vacations and more. Size: (L)8.07*(W)2.76*(H)5.32INCH Fit LV Neonoe Perfectly. SIZE AND COLOR Of The Bag Organizer:(L)8.07*(W)2.76*(H)5.32 INCH Fit LV Neonoe Perfectly. Color: Black, Red, Brush Pink total 3 Colors Avaible.